Powerful detergent that cuts through tough grease, grime and stains. Commercial grade for use in both high and low temperature machines and will make your dishes shine. It's simple, by shipping our product as concentrates, we are able to pass the savings onto you. Cuts through tough grease, grim and stains. Dining ware will look brand new every time. Commercial-Grade product for use in both high and low temperature dishwasher machines. 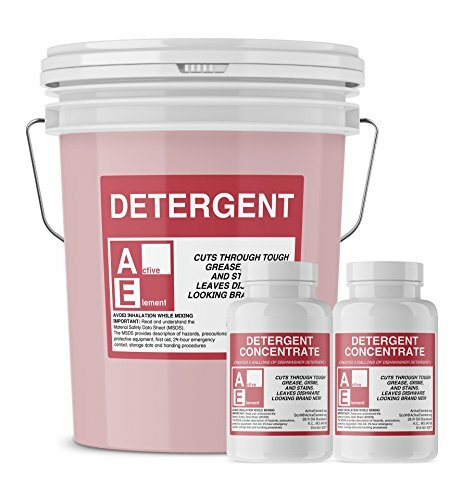 Sold as concentrated powder that makes 5-gallons of powerful detergent. Pail not included. Cost effective product and free shipping. Not for household use. Do not use on aluminum kitchen ware. If you have any questions about this product by Active Element, contact us by completing and submitting the form below. If you are looking for a specif part number, please include it with your message.